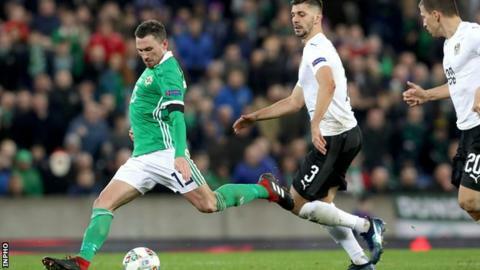 Blackburn Rovers midfielder Corry Evans is an injury worry for Northern Ireland's forthcoming Euro 2020 qualifiers against Estonia and Belarus. Evans, 28, came off after 68 minutes of Rovers' 4-2 defeat to Sheffield Wednesday on Saturday and has undergone a scan on a hamstring problem. NI manager Michael O'Neill expects him to join up with the squad on Monday. "There is a little bit of a doubt about Corry. We'll see how he is as the week progresses," said O'Neill. "Will Grigg and Gareth McAuley are two that we will monitor over the week but everyone else is fine," he added. Evans has been capped 52 times and scored two international goals, including one in Northern Ireland's last game - a 2-1 Nations League defeat by Austria in November. "We have a lot of pace in the team and the young lads have brought a freshness to it but we're still reliant on those players who have been consistent for us over the years as well."